Barbara Havers has gone in over her head, and the morass into which she has slogged out of love and friendship is only getting deeper. 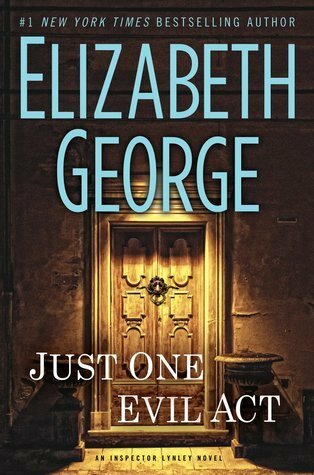 I’m a long time fan of Elizabeth George, a writer I would never have tried on my own initiative, preferring stories that star working class heroes, but one of her early works was given to me at Christmas one year, and I was sucked in by her combination of palpable settings rendered in a painterly fashion, and what at times is intense, tightly plotted crime fiction. Every writer who maintains a successful mystery/crime/detective series of any length faces a conundrum, sooner or later. For the sake of a good story, they’ve already been forced to twist the real lives of their police officers (or their whoever) to make them more exciting, but in the beginning, it’s easier for the reader, who also wants a good yarn, to buy the premise. Sure, someone might become a hostage, or be forced to dig their own grave while the minutes tick by and we wait for the cavalry to charge in and save the protagonist. Certainly, a person could be pistol-whipped and stuffed into the trunk of a car. There appear to be two successful ways around this, and the author can utilize one or both and if they are skillful, they can keep their series going strong. Noteworthy writers like Sue Grafton, James Lee Burke, Sara Paretsky, Ed McBain, GM Ford, and a host of others have carried them off well. One way to keep the string going is to create stories that are not only thrillers or mysteries, but are more novel-like in many ways. The protagonist’s personal life is further developed, and if this is done successfully, it gives us still more buy-in to the mystery plot into which it is woven. And here, George has been more successful at some times than others. There is always the danger that in presenting us with the protagonist’s deepest emotions, the story can turn into a soap opera. Mystery readers don’t need the corn. They’ll pass on the series if the writer crosses a line or is not credible. But referring back to most of the writers in the list above–and if you love a good mystery series, you can probably name others–it’s clear that it can be done. The other way to keep the string active without burning out the protagonist is to further develop secondary characters and turn them into protagonists themselves. I have been greatly cheered to see George develop both Winston Nkata and Barbara Havers in this manner; this particular book has original protagonist Thomas Lynley working in the shadows, and his life pops up from time to time as well in ways I found appealing, but the chief protagonist of this work is Barbara Havers. And Havers is beyond question a working class protagonist. She came from no money whatsoever, and her only living family is her mother, who is in a care home and partially dependent upon Barbara, whom she does not even recognize any longer. It’s one lonely life. What do such people do? They may become self-absorbed or clinically depressed, or both. Or they may get by with a little help from their friends. And this is the crux of this particular episode, #18 in the Lynley series. (No ARC here; I got my copy from the library, but would otherwise have requested it at Christmas.) Havers has long had a friendly relationship with Lynley, her former partner. He’s a lovely bloke, but he doesn’t come from the same side of the tracks as she does, and there are definite limits to their friendship. His love life, and hers if she had one, are not up for discussion. Her closest friend is her neighbor, Taymullah Azhar, and his daughter, Hadiyyah, a precocious nine-year-old who has become nearly a surrogate daughter to Havers. The two of them are often the bright spot at the end of a long, often thankless day at work. When Hadiyyah is kidnapped, Havers is beside herself. She has to help. When her boss tells her that she is to stay away from this investigation, from which she has absolutely no professional distance, she looks for ways around the order. She can investigate when she is off-duty, right? Except she uses her police credentials to open doors. Well, she probably would not be the first. But again, and again, and again she pushes the margin of what she may do and keep her job. The result is a tightly packed psychological thriller that at times kept me awake. Was that really 700 pages? It surely didn’t seem that long! And here we are. Havers does, metaphorically of course, go into that house, the one with no lights and things that go bump in the dark. And all sorts of interesting ethical issues bump up against her. When is lying to your boss justified? Well, that’s not so hard…but what about lying to a friend? What if, in lying to one friend, one may save the life of another…but the life of the friend to whom you have lied may be damaged? When should journalists be called in, even if they cannot be trusted not to assassinate the character of an innocent individual while carrying out your important mission? What if there does not appear to be any other way to save a life? To stop a killer? I was surprised to read some fairly vicious reviews of this novel. I loved it, for the outstanding manner in which setting was incorporated so palpably without slowing the course of the plot; for the development of characters (and Isabelle Ardery, boss back at Scotland Yard, is another). And I enjoyed the ambiguity of the questions it raised. Immensely satisfying, and highly recommended. This entry was posted in mystery and tagged book blog, detective fiction;, Just One Evil Act review, murder mystery, mystery, Thomas Lynley series by seattlebookmama. Bookmark the permalink.